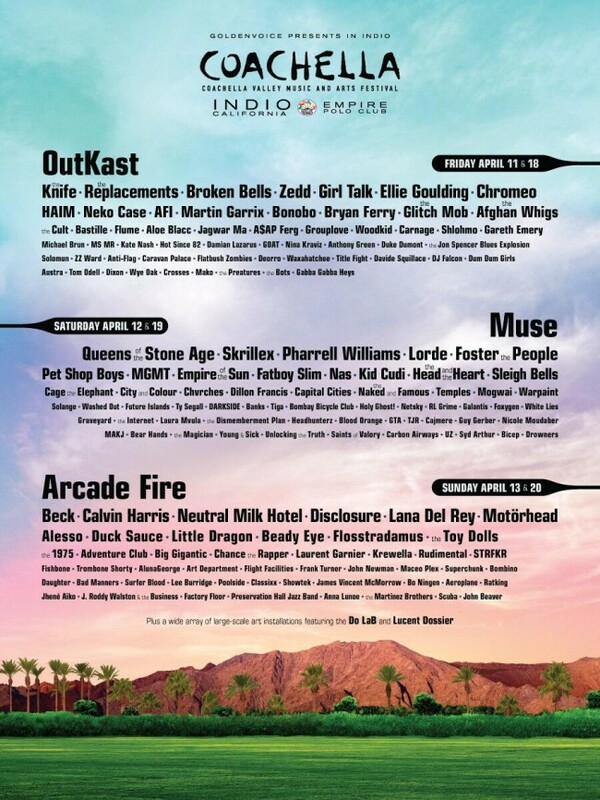 THE Coachella Festival is back, announcing the 2014 line-up, much to the excitement of people on Tumblr who are hipster enough to fawn over it, but alas, too poor to actually afford to attend. The big news is that the festival will have a recently reformed Outkast headlining, which is good news for all. Also topping the bill are Muse and Arcade Fire (Queen 2.0 and Music For Dads, respectively). In a post on Twitter, the festival revealed the line up for the April event, with the message “Share it like a polaroid picture”. You can see that here. As you can see, a load of really famous people are on, like Queens of the Stone Age, Pharrell, Beck, Lana Del Rey, Motorhead and the Replacements. What about the rest? Well, here’s your handy guide to what’s going down and will invariably look like the rest of the festival circuit in 2014. The new Wilson-Phillips, but better than it sounds, HAIM, will play at the festival, as will ace dance outfit, Disclosure. Chrvches are on too, and they’re really fun synthpop from Glasgow. The excellent Laura Mvula takes to the stage as well. The Knife and Chromeo will be cool… for ten minutes. Dum Dum Girls appear too, coming on like the Shang-guitars, but not as good as Warpaint. 2013 was an excellent year for hip hop and R&B and there’s a smattering of acts at Coachella. The icy cool Jhene Aiko makes an appearance, as does the outstanding A$AP Ferg. Solange (the cooler of the Knowles sisters) is billed as is hip thing Chance The Rapper (he possibly made mixtape of 2013). Bassbin troubling Flosstradamus should wreck some eardrums and Shlomo brings skewed soulfulness too! The legendary Nas will attend, to self-aggrandise better than anyone else on the planet. Sadly, there’s not nearly enough hip hop (and related) in the line-up. QOTSA, while fun, are purveyors of thoroughly backward-looking bloke rock. Even more regressive is the waddling nonsense from Liam Gallagher’s Beady Eye outfit. Bad Manners appear to make some old people pogo around, while Foster the People, Bastille, Neutral Milk Hotel, Sleigh Bells and MGMT all stand on-stage, meekly mewing into their mics and shuffling around like non-school uniform day. Add to that, Arcade Fire and Muse, and you’ve got the kind of festival that young people should be actually rioting against. Frank Turner will also be annoying everyone with his dreadful Tory-folk. Cage The Elephant, The 1975 (the most annoying band on Earth), Little Dragon, The Head And The Heart, The Empire of the Sun, Ellie Goulding, AFI, Neko Case and much more sludgy and/or drippy puke clogs up the rest of the bill. There’s a decent amount of festival dreck at Coachella. High up the bill is the unfathomably popular Calvin Harris – a one-trick-pony who should be applauded for getting away with absolute murder, getting bafflingly famous singers to work with him, and thereby ostensibly being The British David Guetta. Skrillex will attend with his paint by numbers dubstep, while house troubler Alesso will ride the bass and waft him arms around, not unlike Fatboy Slim, who is also on. Rudimental are on too, to play drum ‘n’ pop and appearing for the shits and giggle will be Duck Sauce who did that song about Barbra Streisand. Presumably, LMFAO weren’t available for the irony slot this year. Which is always very pleasing.